Pair of desks fixed together. Footprint 1400w x 1640d mm. White MFC top with black edging. Electrically height adjustable from 620 to 1280mm high. The continuous channel between the desk top and screen allows for monitor arms, desk top power/ data modules and lighting to be clamped to the back of the desk. 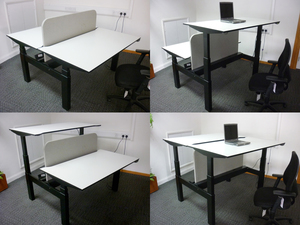 The cable tray is integrated within the frame of the workstation, a very neat and tidy solution. Touch sensitive stopping mechanism if top gets stopped on way up or down.